In a time when everything seems to be going online, you would be forgiven for thinking print marketing was an old fashioned marketing method – but believe us it certainly isn’t. When part of a well-planned marketing campaign, print marketing can put your business in front of your target customers. It can also be used to help retain existing customers and drive loyalty and engagement. 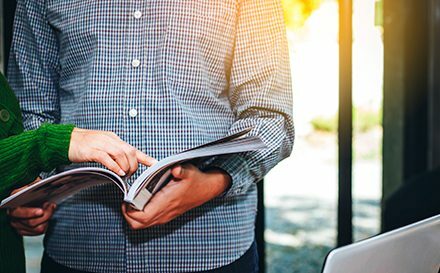 It is important to ensure your print marketing strategy keeps up to date with the latest print marketing trends. You need to ensure your printed materials promote your business in the most positive light. You can show your business is aware of changes and able to adapt to them. Above all make sure it communicates your key messages in the best possible way. Let’s take a look at some of the trends taking the print marketing world by storm at the moment. While this is not a new trend, it is still a big one and an important one. We have been seeing more and more businesses using natural hues in their print marketing campaigns. It is a trend that looks set to stay in favour for the foreseeable future. Natural colours evoke feelings of promises, hope and transformation. From colours that are bright and vivid to those that convey an earthiness, consider using colours that surround us in nature. From grassy greens to earthy browns, floral pinks, oranges and yellows. Using natural hues helps businesses convey their messages about caring for the environment and being green. Reinforce this message with your print marketing by teaming natural hues with high quality recycled paper. Personalisation is particularly important if you are targeting millennials with your print marketing. Research has shown that personalisation is one of the most effective ways of engaging with what can be a tricky demographic to interest. Adopting personalisation as part of your print marketing strategy is key. It will help you build and improve your relationship with customers. It can help you stand out from the competition. Personalisation should be part of your direct marketing campaign. It can be used to personalise your product packaging. Coca-Cola’s ‘Share a Coke’ campaign is a great example of personalisation. Other big brands have since adopted personalisation on their packaging. These include Nutella, Marmite and most recently Onken have launched their ‘YouGurt’ campaign. Digital print has grown over the last few years. It offers some distinct advantages over traditional printing techniques. These include high quality printing with fast print turnaround times. It can offer reduced printing costs at smaller quantities. More businesses are using digital printing techniques for their print marketing campaigns. This number will continue to grow. We are one of the leading digital printing services in the UK. We print all kinds of work. This includes stationery, leaflets, brochures, folders, catalogues and much more. We work very closely with many of leading creative agencies. We also work directly with a variety of different businesses. We can offer both digital printing and lithographic printing from our Redditch premises.